Train your puppy or dog to come every time you call. No matter where you are or what he is doing, with this in-depth training guide from best selling author Pippa Mattinson. My dog won’t come when he’s called! Imagine watching your dog racing towards you with the wind in his ears, after hearing a single ‘toot’ of your whistle. One that all dog owners should experience, but sadly many dogs fall short. Some only come when they feel like it, and others won’t come at all. This is a nice and easy, step-by-step approach to teaching recall and other skills, and I’ll give you some exercises to work through too. Is this for dogs or puppies? At one time, when recall training techniques were harsh and uncompromising, we trained adult dogs very differently from puppies. Fortunately, times have changed, and there is no need to use punishment or ‘corrections’ in recall training anymore. 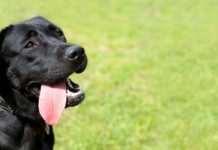 [wp_ad_camp_5]In fact, correcting a dog during recall training can actually make his recall worse, because it reduces his motivation to be near you. 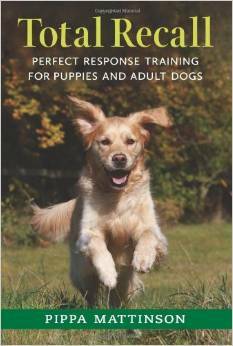 As modern dog training is based on positive reinforcement, training can begin from day one. So you can start training, from the very first day you bring your puppy home if you want to. And the exercises I will give you are suitable for both dogs and puppies alike. Small puppies have not had time to get into bad habits, and are still naturally inclined to follow their humans around quite a bit. For these reasons, training a new puppy may be quicker and easier than training an older dog. You’ll find that many dogs will come when they are called, provided there is nothing better to do. But that is not good enough. Recall is an important command and you need your dog to come every time you call, not just when he feels like it. If your dog won’t come when he is called, don’t panic. We can fix that. The fact that you’ve tried and failed before isn’t relevant. We can fix that too. We’ll look at re-training a dog that has a poor recall as well as starting over with dogs that don’t come at all! 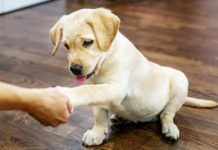 The process is the same, but if you are not starting with a young puppy, you will need to think of a new command or signal to teach your dog to respond to. Dog’s don’t come, because they have not been sufficiently motivated, or motivated for long enough, to create a trained response. A trained response is an automatic reaction. It’s not something that the dog has to think about, or make decisions about. We work through each stage at a time and then move on to the next. He’ll just come. He won’t be able to help himself. Let’s get started shall we? [wp_ad_camp_2]The cue you pick is entirely up to you. It could be the word ‘come’ or the word ‘here’ or some other word you happen to prefer. Or it could be a whistle. You can also train your puppy or older dog to come to more than one cue. You might want to use the word ‘come’ when he is nearby for instance, and the whistle, when he is further away. That’s fine, but you need to pick one or the other to begin with for the purposes of this training. You may think that the last two are nice things to do to a dog, but to most dogs, a pat on the head or the words ‘good dog’ are just boring. He gets nothing of any value from them. And experiments have shown that praise alone is not effective in changing a dog’s behaviour. It must be accompanied by physical demonstrations of affection such as petting. So you can see, we already have a problem here, where coming to you, is either unpleasant or boring for your dog, at least some of the time. So our first step in recall training is to make the very act of running towards you, the best thing that happens to your dog all day, any day and anywhere. The first stage of training is to ‘get’ a behaviour you want. To ‘capture’ it in some way, and make it pleasurable for the dog. You decide what you want, and engineer a situation where it happens. Let’s see how that works in practice. Getting the ‘recall behaviour’ going is easier than you think, you need to engineer a situation where it happens then turn it into a brilliant experience for your dog. And yes, it involves food, games, being silly, whatever it takes to put a grin on your dog’s face. What it does not involve, is your cue. This isn’t about barking orders you can’t enforce, or saying anything meaningful at all to your dog. This is about one thing only, getting your dog chasing after you. Fortunately, dogs are curious, and dogs love chasing. 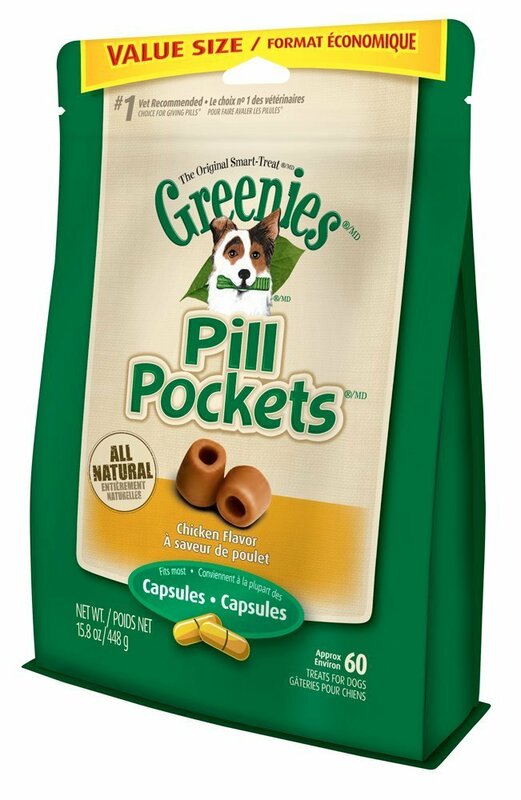 We use training treats for recall training, but treats is not really the right word. You want genuine food because you are going to be using a lot of it, and you don’t want your dog eating a ton of junk. Small puppies under three months old are easily impressed and still under the delightful impression that you are the best thing that ever walked the planet. They will be blown away by simply being allowed to get next to you and eat a piece of kibble while sitting on your lap. With older dogs you need to up your game. Food rewards must be high value and that usually means messy. You’ll need some kind of washable treatbag. Washable because it is going to get messy. It needs to clip onto your belt, around your waist, or simply go inside a large pocket and it needs to contain a fresh supply of your messy smelly, delicious meaty or cheesy treats. This bag needs to go everywhere you go with your dog. If you forget your bag, forget your recall training for today. 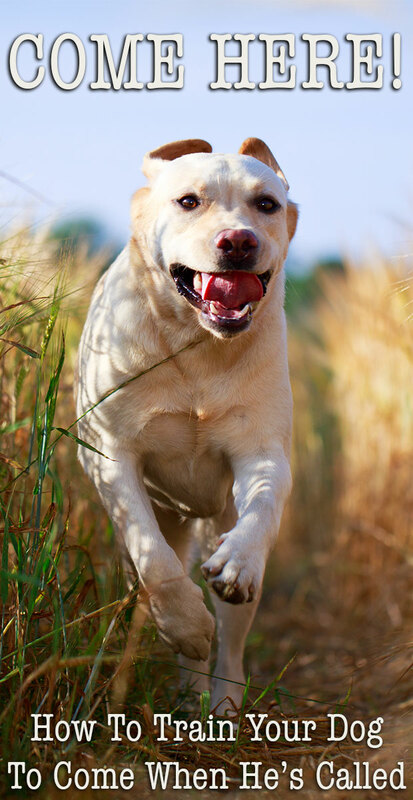 Never, in the early stages, let running towards you end in anything less than a brilliant experience for your dog. Before you start training at Stage One, make sure you read right through the instructions, including the common mistakes, so that you can avoid making them. Once you are clear about what’s involved get your treats and your dog and find a quiet place to train. A large room in the house is ok to begin with, or outside in your yard or garden. Just make sure the area is secure – your dog can’t wander off – and there are no other people or dogs about. Don’t try to train in extreme weather – that is a distraction too. Wait until your dog is a short distance from you and not distracted by anything that might take his attention from you. Wait for him to look at you and walk purposefully away. As soon as your puppy starts to move towards you move away more quickly to speed him up then turn to face him and feed him one of the delicious treats when he reaches you. If he is a small puppy, get down on the ground, pull him on to your lap, and make the biggest fuss of him ever, while feeding him little pieces of kibble. This stage may seem laughably simple, but it is crucial. Don’t miss it out, spend several days on this. We’ve barely got going and I’m going to have to talk about mistakes. But don’t worry. Most of the mistakes tend to be made at the beginning. Once you understand the process, you’ll find you make less mistakes. Keep your treats out of sight. Don’t wave food around, shake your treat bag, or in any way use the food to bribe your dog to move towards you. If you bribe him now, how are you going to cope when you don’t have a bribe or when he decides he prefers to run around with his ball? Bribing is not a good long term strategy – it only works when there is nothing better on offer, and it won’t get you very far at all. So keep your food in your bag or pocket until after the dog has chosen to follow you. 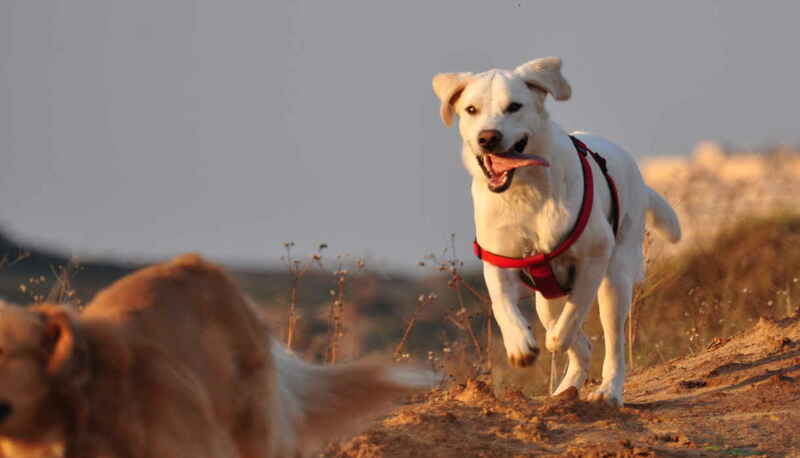 Dogs don’t just love chasing, they love to BE chased. If you follow your dog, or take so much as a single step towards him, he is calling the shots. Don’t do it. His job is to get himself over to you. If he does that, he’ll get a big reward. But only if he does what you want. Don’t call your dog! Don’t say his name and definitely don’t say COME or HERE or any other variation of his recall command. Because if he doesn’t come, you have just taught him to ignore your shiny new cue. If you make this mistake more than once or twice you’ll need to think up a different cue and start again. Just DONT call your dog. I know how many people feel about using food in dog training. It feels like cheating, or bribing, and the dog should work for love alone – etc etc. I’ve been there. And I can tell you, that if you want the fastest and best and most reliable recall, you need to use food. And you will never regret it. Some people don’t want the mess of carrying meaty goodness around in a bag. Or the hassle of chopping up bits of roast chicken. No distractions really does mean no distractions. At this point. Later, at Stage Four, we’ll begin adding distractions in a structured way. But right now? Keep it simple. We’re using food as the reinforcement for the behaviour we’re trying to get right now. So don’t try and train a dog that has had a meal within the last hour or two. Your treats will be more valuable to him if he has an edge on his appetite. So, now you know what to avoid doing, let’s look at what you can do if things don’t go quite to plan. What if the dog won’t follow you? Sometimes you get a situation where a dog has just decided that his owner is boring. He doesn’t look at the owner very much, isn’t very interested in them, and can’t really see any purpose in following them. Okay, did you get the behaviour you wanted? Did your dog walk or even run after you, and did you surprise him with you amazing treats? Now you need to repeat this sequence as often as you can in a five minute training session. Repeat that training session 3-5 times every day, for a week. During this week, do not use your new recall cue at any time. 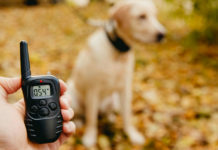 If you need to recall your dog out on a walk, use his old recall. Avoid calling him at all unless you have to. Avoid areas where you know you’ll struggle to get him back. If his recall is rubbish, every time you call him you give him another opportunity to rehearse being naughty and ignoring you. You can also use the About Turn Walk – this is a very effective technique to keep your dog closer to you on walks. It may be useful to you while you are working on these early stage in his new training with an older dog. That’s all there is to Stage One. It’s really simple and you should breeze through it. 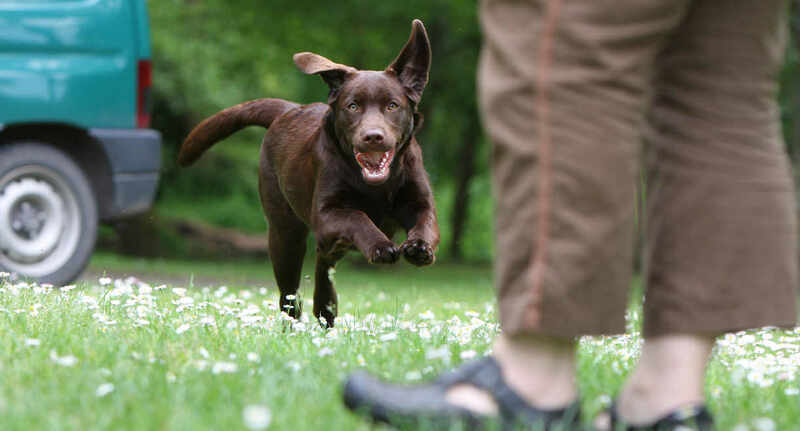 You are teaching your dog that following you and catching up with you, is a good thing – a happy thing, exciting even. 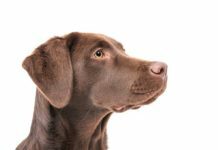 Dog parents that have previously been considered dull by their dogs will find their dog looking at them in a new light. Now you are ready to Pair It! Well, this is the language lesson part of the training. Your puppy has no idea that COME means “run toward my wonderful owner and friend”. No idea at all. To him, come is just a sound. It has NO meaning whatsoever. If you start saying COME or whatever your new cue is, to your dog at this point, there is a high chance that he won’t come. And then you are back to square one again with a word that your dog associates with disobedience. Keep your cue sweet, and don’t use it unless your dog is running towards you. In addition to your treats and treatable, a whistle is a useful piece of equipment at Stage Two recall. I recommend you use a whistle for recall training. Partly because it is a clear and consistent cue that is easily heard at some distance, even in windy weather. And partly because you can prevent other people getting hold of it and calling the dog before he ready for that part of his training. Pick the number of pips you want to use and stick to it. You can choose two pips, three pips, or four pips if you prefer for your recall cue, as long as you are consistent make your cue exactly the same each time you use it. When you read the instruction – “give your whistle cue” that means use your string of pips, however many you have chosen. Of course, if you prefer, you can just use a verbal cue. As before, keep your dog away from distractions. You don’t want him changing his mind and darting off to play or chase squirrels after you have given the cue. You’ll be teaching your dog or puppy that the word COME or your whistle cue, means run fast towards you, by a process of association. You’ll simply repeatedly PAIR the cue and the behaviour together. There are two ways to do this. You can initiate a recall yourself, and you can take advantage of check ins. If you are using a whistle, have your whistle lanyard around your neck. The whistle itself should be in your mouth, not in your pocket. Hold it between your teeth so you are ready to give the recall cue. Wait until you have your dog’s attention and begin moving away from him. Watch him move towards you and as soon as he breaks into a run and commits himself to the recall, give your cue. Give it once, and once only. Your dog should be really interested in you by now. And there will be times, when you are out and about, especially with an older dog, when he is off doing his own thing and then he decides to ‘check in’ on you of his own accord. You might be walking along a path and he’ll suddenly dash towards you. This is your check in. Grab the opportunity it offers you – blow that whistle as he arrives in front of you and throw him your best bit of chicken. Check ins are a great chance to reward your dog for paying attention to you, and to reinforce the belief that there is nothing quite so wonderful in life, as a recall. Don’t give the recall cue until the dog has committed to travelling towards you. The last thing you want is for him to change his mind en route. The whistle is no use at all in your pocket. Even the time it takes you to get the whistle in your mouth when it’s hanging around your neck is a lost opportunity. While you are training, the whistle should be in your mouth. Practice until the ‘pairing’ association is strong. Just because you are not giving commands yet does not mean you can skimp on this part. Keep at it for at least a week for older dogs with no severe recall issues in their past. 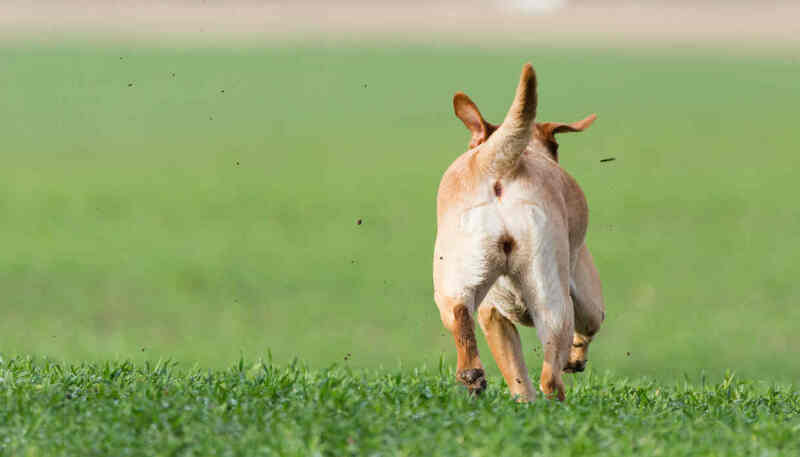 Longer for dogs that have a history of absconding, or for small puppies who will benefit from several weeks of short ‘puppy recalls’ where you don’t call the pup until he is on his way to you. Okay, here comes the fun part. Now you are going to teach your dog that your whistle or cue word is a signal. And that the signal requires a response from him. He will probably run right up to you for his reward. Make sure you have it ready. What if he doesn’t come? Check you are using sufficiently high value rewards to motivate your dog. At this stage in training this is crucial. You don’t yet have an automatic response, motivation is essential in order to get there. The next step is to give your dog lots of surprise recalls. No distractions yet, but call him when he is not expecting it. From another room in the house, from the garden, from his bed. Call him when he is asleep, or resting, when he is sitting, when he is lying down. Make it worth his while, every single time. If your dog does not come when you give the cue do NOT give the cue a second time. You’ve seen people jumping up and down, screaming “come, come, COME, come here, COME HERE you BAD dog”, a million times before their dog deigns to wander over. One cue, One response. That is the rule. Sometimes people panic at this point and show the dog the food. Don’t do that. Attract his attention, do what you have to do to get him to you, but don’t ever beg or bribe your dog. If you have done your preparation, this stage in training will be as easy as falling off a log. 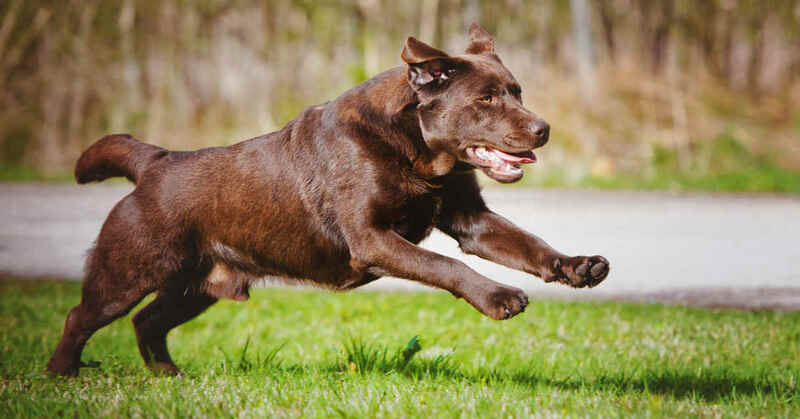 You already have a dog that LOVES running towards you. And he is a dog that has a strong association between running towards you, and the signal you are about to give him. This is where things start to get interesting. This is the part where you train your dog to come in the presence of all kinds of situations, in different locations, and with all manner of distraction things happening around him. This is formally known as proofing your recall. As you might expect this is the longest part of the training process. And the part that separates all well trained dogs, from dogs that have a poor recall. During the proofing process you will be introducing distractions to your dog. You’ll be introducing them gradually so that he has every chance of resisting them and coming to your cue. But there is a chance that you will make a mistake and step the distractions up too quickly. The long line will ensure you can prevent the dog getting access to a rewarding experience after disobeying your cue. The body harness is the safest way to attach a dog to a long line. Never use a long line on a choke chain or slip lead of any kind. If you don’t own a harness or are not familiar with them, do check these out. Stage Four begins with a list. Make a note of all the different situations in which you would like your dog to come when you call him, but where there are distractions. He’ll need to be able to recall in all the locations you might take him. Each of these things needs to be taught and practiced separately. That is where most people fall down. They assume that because their dog understands ‘come’ in the garden, he’ll also understand it at the dog park. Sadly, this simply is not the case. What you have to do, is set up a situation where your dog can practice but where you can also control the outcome. gets a fantastic reward when he reaches you. Food is a good one to start with, not because you need to be able to call your dog away from food very often, but because it is a nice controllable way to teach a dog to come away from something he wants, in order to get something from you. Unless your dog is very people friendly, you’ll find it easier to teach him to recall away from people, than from other dogs, so tackle people first. You’ll need a helper. Make it easy for your dog at the start by putting distance between you and the person helping you. Get your helper to ignore your dog completely. The key to good proofing is managing your dog’s access to rewards. If he gets to do something he shouldn’t after you give your cue, and he enjoys that something, it will undermine all your hard work. And/or have him wear that harness and long line, so that you can prevent him leaving the area you are training in. Each time you start a new item on the list – training on the beach for example, raise the value of the rewards to something your dog finds irresistible. The proofing process is not something you can rush, it usually takes months. But that is ok. At the end of it, you have a dog with a brilliant and reliable recall that will give you peace of mind and help to ensure his safety and happiness. Most people that complete Stage Four don’t have too much trouble with Stage Five. However, there are a couple of mistakes people make, and the most common one, is to stop rewarding the dog. Now, it is possible to fade rewards to a certain level and still have a good recall response. But how far and how fast to fade rewards will depend on your dog. People tend to get into trouble at this point by fading too fast or too far. Don’t forget to motivate your dog! When can I quit rewards? Quitting rewards altogether will result in a process called – extinction. Which basically means the ‘death’ of your response, and a massive waste of all the effort you put into training your dog. So don’t be tempted to do it. It is fine to try different kinds of rewards as long as they appeal to your dog. Some dogs will feel very rewarded by a game with a ball or a massive cuddle. Others would rather skip the cuddle altogether. Don’t forget, you can also reward a dog by giving him access to things he enjoys. Such as a chance to play with another dog. A nice way to keep your dog’s recall sharp is to give him the occasional jackpot. A jackpot reward is an ultra big or ultra special reward that only comes occasionally and unpredictably. How long does it take to train a recall? [wp_ad_camp_1]But of course we all have different starting points and in some cases different finishing points too. How many mistakes you make. 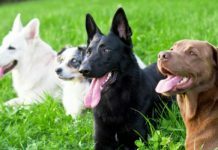 Puppies learn very fast to begin with, but older dogs can learn quickly too, if they don’t have a history of absconding. A dog that has been running away for six months, may take six months to train. A dog that has been running away for a year may take a year to break of the habit. Though some quick learners will get there sooner. The first three stages will be completed quickly – just a few weeks. Expect proofing to take several months. With a puppy and not too many mistakes, you should have a pretty solid recall in distracting situations, by eight or nine months old. Some pups will get there a bit sooner, others, a bit later. Recall is a big subject. Big enough to fill an entire book! You’ll find lots of examples of different training scenarios and set ups in there too. Total Recall is an Amazon best seller and has had many fantastic reviews. Good luck with your training, and share your experiences in the comments box below! I’m not sure if anyone checks this anymore? I have “Total Recall” and have worked through the early stages with my 9 month old Springer. The problem I have is space to train him. Walking isn’t a problem, I live in the countryside and have open fields at my garden gate. But my home and my garden are tiny, certainly not big enough to get people involved or other dogs. I can’t train him in the fields either as the second he is off the lead he is gone! Chasing birds and sniffing them out. A long lead doesn’t work for the same reason, he is at the end of a long lead and pulling it from my hands in seconds. In the house I have him at the stage where he will come away from food, he will come if from the garden and from sleep. But i can’t see a way past these stages with my domestic situation. Any help would be appreciated. Just started the recall training on my 2 year old Spinone. He’s recall is poor so taking my time with him. Can I use a 10 meter training lead and harness from stage 1 as I am presses for a safe open space I can let him off lead. I have a 2 year old toller who’s been blind since birth and am starting over with his recall since reading your article. As he’s aged, he’s settled down a bit and I think we’re both ready now to get this right. Stage 1 started as more of a challenge since he can’t see me, but I’ve been shuffling my feet on gravel to get his attention listening & then running noisily and he’s running toward me. I clap my hands to make it easier to find me. This is moving along well so far & I want to thank you for your articles and book. Though he’s not a labrador, he’s a retriever and food is a huge motivator for him. I have an older dog and would very much like to use your method to train a reliable recalll. Lucy-Mae is very food motivated. In stage one of your process, she won’t leave my side if I have Excellent treats. What should I do? I can’t walk away from her as she is circling around me. Suggestions? Love your articles. Looking forward to having your book. I have a 10 month old male Cane Corso and just recently got a 8week old female one also. My 10 month old, when called, listens a good 90% of the time but I want to perfect his recall and my 8wk old…well she’s a blank slate 🙂 two questions….should i/do I need to start from scratch with my 10month old?? And can I train them on recall at the same time, both of them at once? And if so, is there anything different I should be doing then what you’ve laid out above?? Than you for your great training articles and especially this one!! Hi Pippa, thank you for the great article! I have a couple of questions. Does the rewarding has to be done only during training sessions? Or shoud I reward the dog *every time* he comes to me, whatever his motivation is? If I use the training session format, as soon as my 8 month lab notices the smelly chicken he starts following meall around, I feel I’m not teaching to come to me but to follow me. Generally he follows me to be near when I change room or when I head off to fill his plate. The times he definitively comes to me are: when I get home/when I start preparing a meal. If I squat facing him and talking to him he may come either, if he feels like : ) How can I take advantage of this? I have an 8 year old rehome scent hound. I was advised he had no recall (true) and so I have been trying to train him over the last three months since I got him … it is hard! I thought I was making progress so started to let him off the long line on one walk we do and it seemed to be going well then just yesterday he rushed off into the woods. I did everything wrong I guess – I yelled and yelled and yelled his name and the recall cue but no response or sight/sound … eventually after maybe ten minutes (as I started to think I would have to head home and hope someone called me) he appeared and so I gave him food/reward for coming to me. Now I think I have doubly-rewarded him for running off!!!! It is so frustrating. He is very independent and has been used to “going off” for days apparently with his previous owners. But he has such bad road sense, I can’t understand how he survived that without a car hitting him. I thought I was making great progress. He was running toward me because he does (finally) like the chicken — the original treats I tried were hopeless often he just knocked them to the floor rather than eat them. It just really tests your patience! @@ Not to mention worry levels. I was glad to see him but wanted to strangle him at the same time. Now I think I will never ever be able to let him off the lead. I want to throw up my hands and give up. You might also find it helpful to join The Labrador Forum http://thelabradorforum.com (it’s not just for Labradors! ), where you will get lots of friendly help, advice and support. Really great articles and book. I am collecting our 8 week old puppy in a couple of weeks and would like to know if I can train the puppy to respond to both a whistle and a word cue, such as “come”? And if so, in which order would you do this? I would like her to respond to a word cue in case we are in a situation where we or someone else doesn’t have a whistle. It is impossible to start the Stage 1 in my house or in the garden as Mac is following me all the time in the house/garden (when he is not resting). The garden is very small and Mac just uses it as a toilet really. Today, in the park, I had some cheese/sausage for normal stuff such as heel walk and sit, and roast (warm) chicken and tube of liver paste in case I saw the chance of him moving towards me. He looked at me and I walked away, he followed and got the chicken. I could see the pleasure it gave him :). Anyway I am not sure if I made a huge mistake as when he was following me I was moving away facing him all the time. Just before I planned to stop I was getting the food out (would this be classes as bribing?). Did I make a mistake facing him when he was running towards me? I later re-read the Stage 1 instructions and found that I should turn and walk away and face him only to reward him. I think he gots the idea as I saw him checking on me and when he saw moving backwards he immediatelly rushed towards me. It was nice to watch him running fast towards me. I hope I did not do a big damage and can fix it by turning away from him and walking faster when he follows me. Also do you think that it was a good idea to start the Stage 1 in the park, it seemed to work. It is just difficult to surprise him when he follows me everywhere in the house. Hi Pippa, I have a 10 month old lab and started your programme on recall yesterday. At stage 1 – should I be praising him also along with the treat when he follows me. I tried it Yesterday using tuna as the treat and he was very keen to follow me because he loves tuna? Hi Pippa, I have a 9 week old Whippet Pup and I’m a little worried I may have started some things off badly. The info in the happy puppy handbook says to say sit as the puppies bum hits the floor which I have been doing but the articles on the website says that first you should go through a stage of saying yes then progress to sit and say yes when he’s done it, equally my book indicates that I should get the pup running after me and that you use a stream of 5 pips yet above you say one. I’m genuinely wondering should I start over? Would you give me your opinion on whether I am expecting too much of my pup too young. Do you have any guidance anywhere on a suggested order for teaching cues in. like should you get him to sit then stay then progress to recall or do you do it all at once. I’m at a point now where I’m feeling more confused and upset the more I read and I’m sure I’m not the first person to feel like this in training their puppy. You might find it helpful to join the forum for more help and support with training your puppy. It is called the Labrador forum but there are lots of different breeds there too. Great article Pippa, Just ordered your Total Recall book. My 15 month old had hip surgery and we lost some training momentum so sort of back to the drawing board! She’s great except when she would rather play with another dog but I think I don’t reward her enough for coming to me. I am confused by only calling her once though, if she then ignores me what do I do? Hi! Thanks for the article, it was really helpful. I’m training my 4 month old puppy to recall, and it’s going really well, generally even away from dogs. Yesterday though, we were walking in a park with a friend who also had a (slightly older) puppy and they were playing a lot while walking along with us, and my puppy completely ignored the whistle. I understand the principle of only giving the cue once but what am I meant to do? I went up to her and told her off for not listening but I don’t imagine she understood why she was being told off, and immediately went back to playing. What are you meant to do when the puppy is so focused that you can’t get their attention, particularly from a distance? Hi Fran, you need to work through the training system in a logical way. So, when you first start giving the cue, only do it when you can either ‘be sure that the puppy will come’ or ‘prevent the puppy evading you’ If you read #Stage 4 again, you’ll see it explains about using a training line. It is normal for puppies not to want to come when distracted and coming away from distractions is quite an advanced skill for even an older puppy. The best thing to do is for you and your friend to make some noise to attract both puppies’ attention, then run away from them. Once the puppies are coming towards you, that is the time to blow the whistle. When it comes to teaching the puppy to recall away from distractions, it sounds as though you might need to read up a bit more on proofing.